The time has come to eat lots of oysters. I told ya'll last month when I missed the Island Creek Festival that I would do my darnedest to make it to the Wellfleet Oyster Festival (here). And guess what? It's here. 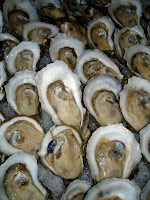 Coming up this weekend is the 8th annual Wellfleet Oyster Festival. The eighth annual Wellfleet OysterFest takes place the weekend after Columbus Day, Saturday and Sunday, October 18 and 19, 2008, in Wellfleet, Cape Cod, Mass. This two-day street party celebrates the town's famous oysters, clams and shellfishing traditions and brings together locals and visitors alike for a weekend full of hometown flavor and big time fun. The town center becomes a walking district that offers something for everyone: local cuisine, arts and crafts, children's activities, educational exhibits, live music and the Oyster Shuck-Off competition. My friends and I will be heading there on Saturday and will pretty much be there all day. See you guys there! Click (here) for a link to the event site. 0 Response to "Wellfleet Oyster Festival This Weekend"